Herein we investigated the morphology, chemical characteristics, and source apportionment of fine particulate matter (PM2.5) samples collected from five sites in Jiaxing. Scanning electron microscopy (SEM) and transmission electron microscopy (TEM) showed that soot aggregates and coal-fired fly ash were generally the most abundant components in the samples. All the samples were analyzed gravimetrically for mass concentrations and their various compositions were determined. Our results revealed that the PM2.5 concentrations in the samples were in the following order: winter > spring > autumn > summer. The PM2.5 concentrations in winter and spring were higher than those in autumn and summer, except for inorganic elements. Carbonaceous species and water-soluble inorganic ions were the most abundant components in the samples, accounting for 26.17–50.44% and 34.27–49.6%, respectively. The high secondary organic carbon/organic carbon ratio indicated that secondary organic pollution in Jiaxing was severe. The average ratios of NO3−/SO42−, ranging from 1.01 to 1.25 at the five sites, indicated that mobile pollution sources contributed more to the formation of PM2.5 than stationary sources. The BeP/(BeP + BaP) ratio (0.52–0.71) in samples reflected the influence of transportation from outside of Jiaxing. The positive matrix factorization (PMF) model identified eight main pollution sources: secondary nitrates (26.95%), secondary sulfates (15.49%), secondary organic aerosol (SOA) (19.64%), vehicle exhaust (15.67%), coal combustion (8.6%), fugitive dust (7.7%), ships and heavy oil (5.23%), biomass burning, and other sources (0.91%). Therefore, PM2.5 pollution in Jiaxing during the winter and spring seasons was more severe than that in the summer and autumn. Secondary aerosols were the most important source of PM2.5 pollution; therefore, focus should be placed on controlling gaseous precursors. • The concentrations of PM2.5 in five sites were in accordance with the rule that winter > spring > autumn > summer. • Secondary aerosols were the most important source of PM2.5 pollution in Jiaxing. • Mobile sources contributed more to the formation of PM2.5 than stationary sources in Jiaxing. The online version of this article ( https://doi.org/10.1007/s11356-019-04205-2) contains supplementary material, which is available to authorized users. 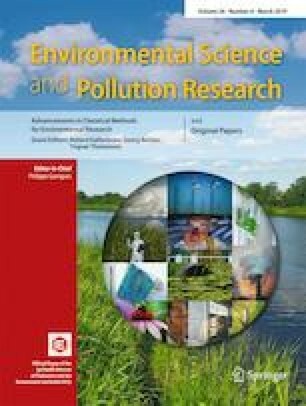 This study was funded by the Municipal Environmental Protection Bureau of Jiaxing (JXSJ-2014-73), and Shanghai Natural Science Foundation of the Science and Technology Commission of Shanghai Municipal Government (No. 18ZR1418300).